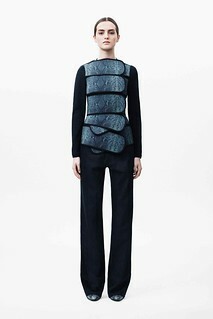 Pre-fall collections are mini-collections formed by midseason pieces. The source of inspiration are the best-selling pieces of the ongoing fall-winter season. Pre-fall collections are supposed to hit stores in May. These collections respond to multiple factors: the unpredictable weather, the increasing travel to the other hemisphere and the constant thirst for novelty. The geometry of Zac Posen. Woolen fabrics sewn slantwise, sophisticated cuts that become visible only when we close up, the dress with the cape and the suit’s excess fabric looking like leaves. 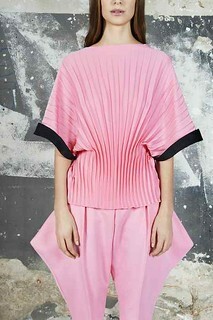 Pleats at Vionnet. Interpreting a fundamental element of the iconic designer and remaining true to her spirit. The long and light dresses at Nina Ricci. A simple cut and a maxi print to remove any red-carpet pretentions. The embroidered gowns of Naeem Khan. He is speaking haute couture here. The sense of color at Fendi. Adding bold blue or rust to a white-black-gray base. Playing with closures at Christopher Kane. Composing and decomposing silhouettes with scratches and zips. Ultimate simplicity at Cushnie and Ochs. We can not do it more classical, but can we do it more classy? Curvy cuts at Stella McCartney. Fringes that cover and discover the skin. You like it? It gives me even more sewing ideas for the coming months. This entry was posted in Moods and tagged inspiration, pre-fall.